A few passing clouds. Low 58F. Winds S at 5 to 10 mph. 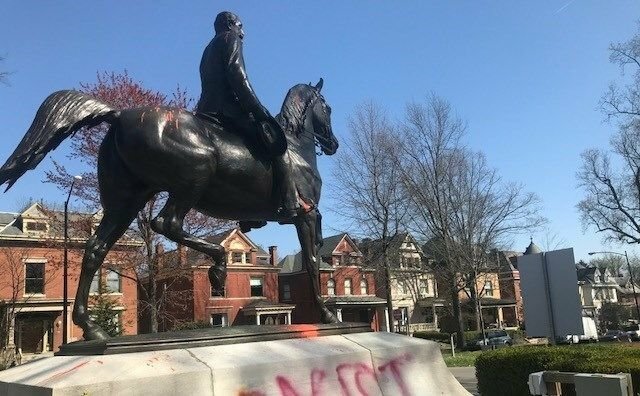 LOUISVILLE, Ky. (WDRB) -- Louisville Mayor Greg Fischer says he plans to appeal, after a committee vote earlier this week that failed to approve moving the John B. Castleman monument from Cherokee Triangle. The mayor made the announcement Friday, two days after a vote by the Cherokee Triangle Architectural Review Committee ended in a 3-3 tie. A majority vote was required to move the statue, because it is in the Cherokee Triangle Preservation district. After Mayor Greg Fischer approved moving the statue in August 2018, the city requested the committee grant a Certificate of Appropriateness so the century-old statue could be moved. Another statue of George Dennison Prentice was removed from its site in front of the Free Public Library in downtown Louisville in December. Vandals have defaced both statues, and the Castleman statue still has paint on it. The city paid $8,000 to remove orange paint from the Castleman statue in August 2018. Fischer says the appeal will be submitted to the Landmarks Commission in the next 30 days. He says he was disappointed with the ARC vote, and hopes the Landmarks Commission will approve moving it.